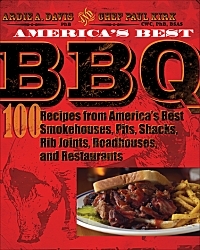 Last week I was contacted by the publisher of an upcoming barbecue book asking for a review. The authors are barbecue legends Ardie Davis and Paul Kirk, and the book is entitled America's Best BBQ: 100 Recipes from America's Best Smokehouses, Pits, Shacks, Rib Joints, Roadhouses, and Restaurants. The book is due out in May. I really enjoyed Paul Kirk's Championship Barbecue, so I am looking forward to the new book. I should have the book soon, so stay tuned.